Make sure you use the right car detailing accessories like microfiber towels, a quality car wash mitt, a good wash bucket, and a reliable car wash brush. Using the proper detailing tools is essential to safely obtain that show car finish. Quality microfiber towels, a soft quality wash mitt, a wash bucket system, and quality drying towels are some of the tools you�ll need. As a serious enthusiast, I would allow very few retail car detailing accessories in my car, let alone put them to work detailing it. Fortunately, new choices in detailing accessories for the serious enthusiast are now available. The Cobra Deluxe Jr. 600 Towels are very specialized for buffing polish, quick detailing, and waterless washing. Notice the soft microfiber edge. The microfiber edge design prevents any chance of paint marring from the toweling. The Cobra Guzzler Waffle Weave Drying Towel is a super absorbent microfiber towel designed with a special waffle weave structure. Its satin border is completely safe on all automotive surfaces to avoid scratching or marring. Since they debuted in the industry, Guzzlers have been my go-to choice of drying towel. I haven�t used a chamois in years! If you haven�t had the pleasure of drying your vehicle with these, they are definitely worth a try. For larger vehicles, I�d go with the Ultimate Guzzler for the quickest drying. Is it necessary to use functionally specific detailing towels on your car? When a towel is specially designed for a specific car surface, you are guaranteed better results with less effort. A lot of personal preference goes into the selection of a car wash mitt or sponge. At Autopia Car Care, there are many choices for safe washing, including the Koala Wash Mitt, the Gold Plush Micro-Chenille Wash Mitt, and the Large Natural Sea Sponge. My personal preference in car wash mitt material has long been genuine sheepskin. The Genuine Sheepskin Wash Mitt has a superior feel and holds volumes of soapy water for a scratch-free wash, making it an excellent choice. If you want an easy care solution, the Supreme Micro-Chenille Wash Mitt is constructed by connecting multiple strands of microfiber to create caterpillar-like strands. These are still soft as your typical microfiber towel, and safe on all paint surfaces. The Cobra Blue Micro-Chenille Wash Mitt is super soft and rinses freely for a scratch-free wash. It's machine washable! Autopia Car Care also offers unique solutions, like a professional wash bucket system. The BLACKFIRE Complete Car Wash System with Dolly makes detailing easier, safer, and more convenient. The BLACKFIRE Complete Car Wash System with Dolly is a complete solution. You may own a nice 5-gallon bucket, but I promise you it's nothing as extensive as this. The 5-caster dolly makes it easy to move. The Grit Guard Insert keeps your car wash mitt clean and debris free out of the harmful dirt that settles to the bottom. The padded seat allows the unit to double as a creeper stool. California Car Care Products is a trusted brand in car detailing and they make great products. Use a car duster to remove light surface dust prior to wipe down. 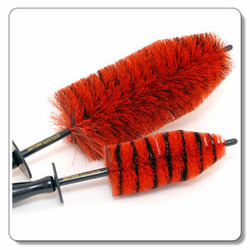 The Original California Duster is the best quality and safest car duster available today. If you drop the duster on your car it won't scratch your paint. The mop head is super soft and safe for all paint colors, including black. The Montana Original 10 inch Boar's Hair Car Wash Brush & Telescopic Handle is one of my all-time favorite car wash brushes. It's safe on all surfaces and fits our 5 gallon wash buckets. It's the perfect car wash brush for giving a thorough yet light scrubbing. Pick your car detailing accessories carefully. Good accessories make detailing easier and deliver results. Bad detailing accessories create more work and are less likely to deliver the results you expect.